In 1994, Karen Simons lost her father unexpectedly to a heart attack. In Opening Heaven’s Door, she describes how about six weeks later, she felt his beloved presence in a very real, life-transforming way. Why should you be considered insane for encountering something so lovely? Here is an account from the Scandinavian writer Johan Kuld, about an experience he had shortly after the death of his wife. It is a tale that one can surely only envy: She came to him, pushing open the door of the room, smiling. “I stared at her as if I was hypnotized and could not say anything.” She felt warm, normal. She explained that she was there to say good bye, and bid him lie down on the bend with her for a time. “I did as she asked,” he wrote. “She stroked my cheek and whispered beautiful things to me. And I was filled with a feeling of joy. Then I was filled with a calm and I was surrounded with a sense of peace that cannot be described with words.” He sank into sleep as she caressed him, and when he awoke, she was gone. “This incident is still so vivid in my mind. It does not get old or fade with the years that have passed since then. I have often asked myself: ‘Could I have dreamt it all?’ But my answer is a definite: “No.” This was reality as far as there is a reality, unusual and unforgettable at the same time. 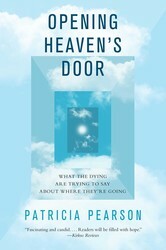 The first book by a respected journalist on Nearing Death Awareness—similar to Near-Death Experience—this “fascinating” (Kirkus Reviews) exploration brings “humor, sympathy, and keen critical intelligence to a topic that is all too often off-limits” (Ptolemy Tompkins, collaborator with Eben Alexander on Proof of Heaven). Patricia Pearson’s work has appeared in The New Yorker, The New York Times, and Business Week, among other publications. A longtime member of USA TODAY’s Op-Ed Board of Contributors, she gave a recent TED talk, “Why Ghosts are Good for You,” which points to research showing the importance of NDAs in helping people cope with grief. She is based in Toronto, Canada.